1 tbsp. White Sesame Seed. By the way, I am using some of the Sambal Oelek I featured in a ‘Spicery’ post not long ago. It uses Thai Bird’s Eye Chilies, which are very hot. If you are using something milder, you may want to up the chili paste amount a little. First, we need to partially butterfly the unpeeled shrimp by cutting down through the belly. Do not cut too deeply, but then press down to open the meat up slightly. 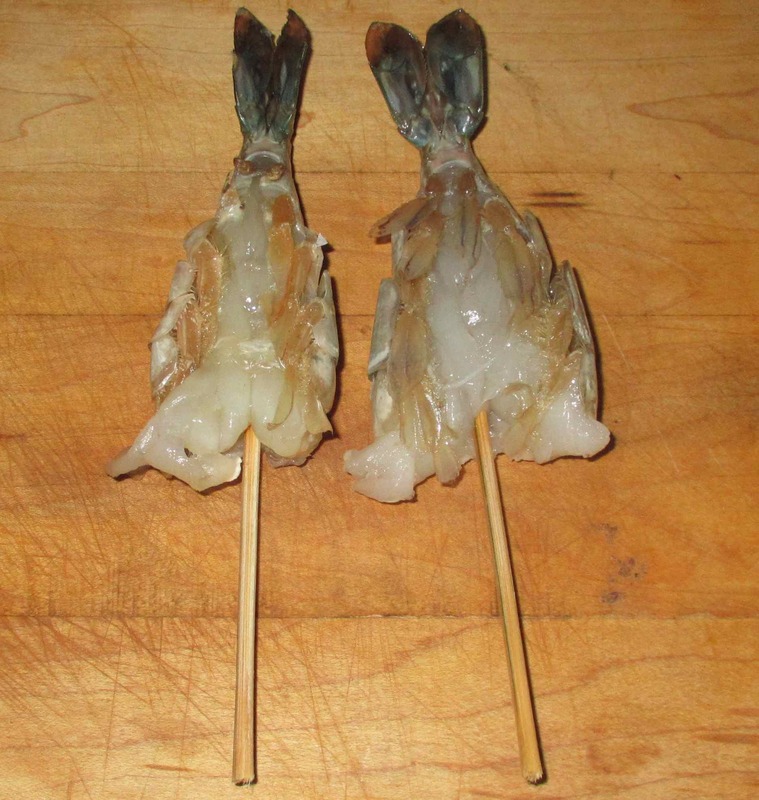 Next, skewer the shrimp lengthwise through the body. If you are using wooden skewers, as I am, you may wish to soak them in water for an hour or so to prevent them from burning. As you can see in the first picture, I didn’t soak mine long enough and, actually, some foil wrapped around the exposed wood might have been a good idea. 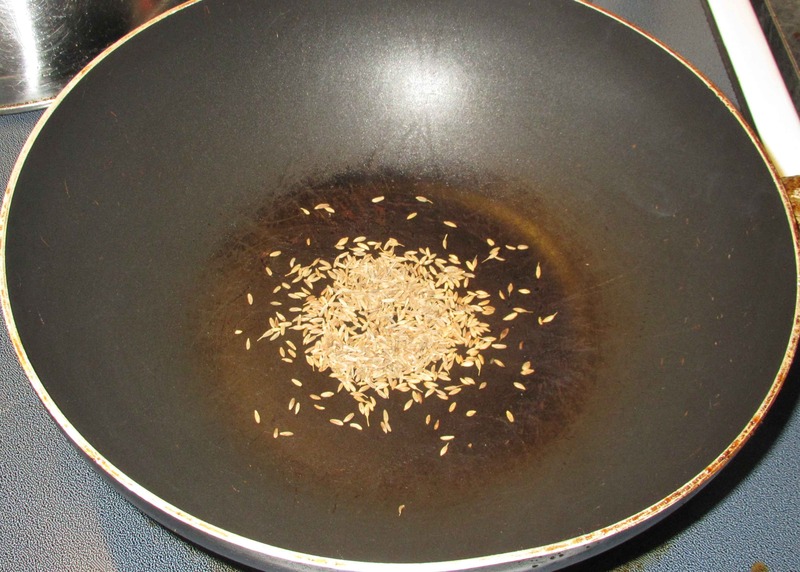 Now, toast the sesame seeds and cumin seeds separately in a dry pan. Toast the sesame seed just until they start to brown a little and do the cumin seeds just to the point that you can smell the aroma. Set the sesame seeds aside for now. Next, grind the cumin seeds along with the sugar in a mortar. Don’t make a powder out of the seeds, rather crush them until they are broken up nicely but some whole seeds still remain. 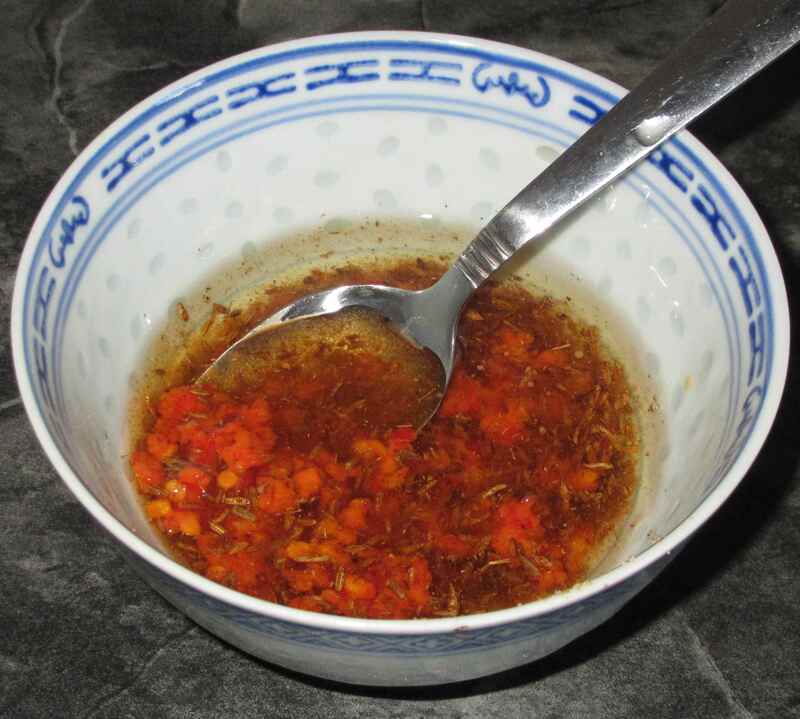 Mix the result in a bowl along with the oils, and chili paste. Set aside to let the flavors meld for an hour or so. 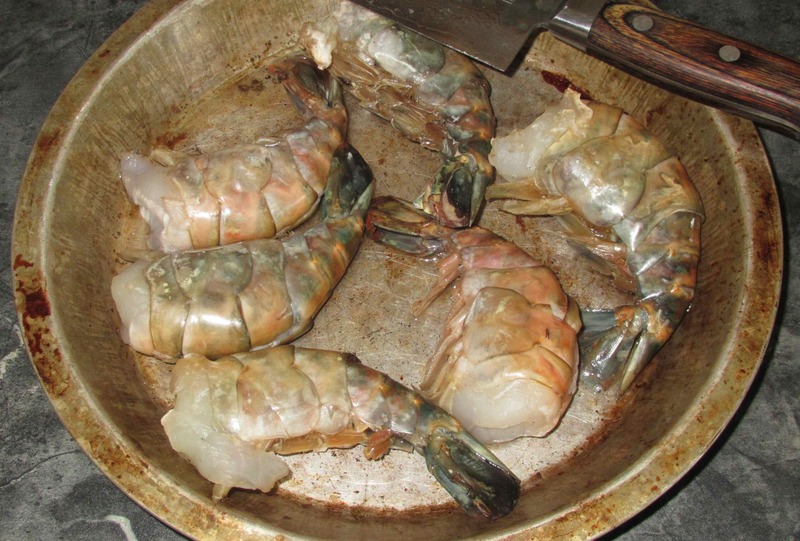 Now you need to coat the shrimp liberally with the oil mixture on both sides, making sure that you work some of the oil and solids into the crevice along the back left from the de-veining process. Sprinkle over the sesame seeds and allow everything to sit for a bit. 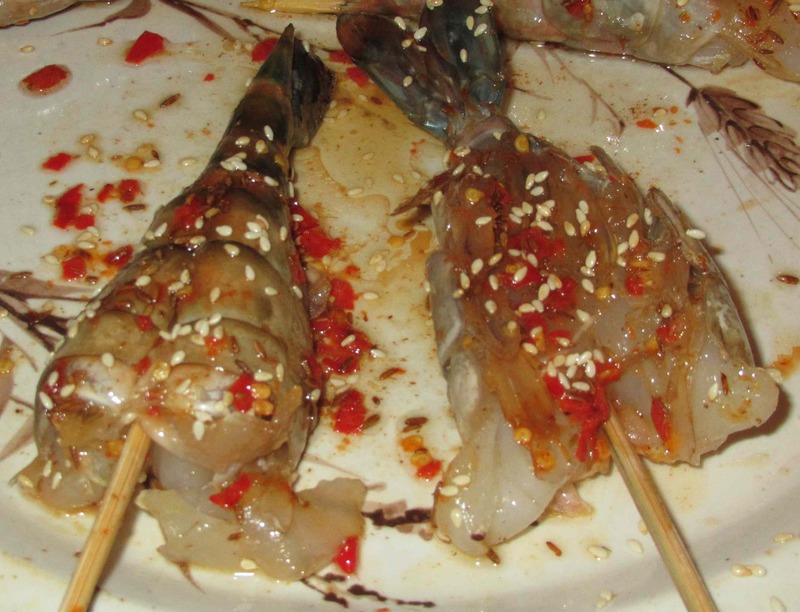 A general rule of thumb when marinating shrimp is to limit the time to no more than 15 or 20 minutes or so, especially if there is any acid in the marinade. This particular blend is not especially acidic so anywhere up to an hour so should be okay. A BBQ would be perfect for grilling these but, since my deck is deep in snow at the minute I am going to be using the broiler in my oven. However you do it, the idea is to grill at high enough heat on each side so that you get some decent browning on the outside but leave the inside flesh still nicely moist and tender. A minute or two per side should be sufficient. 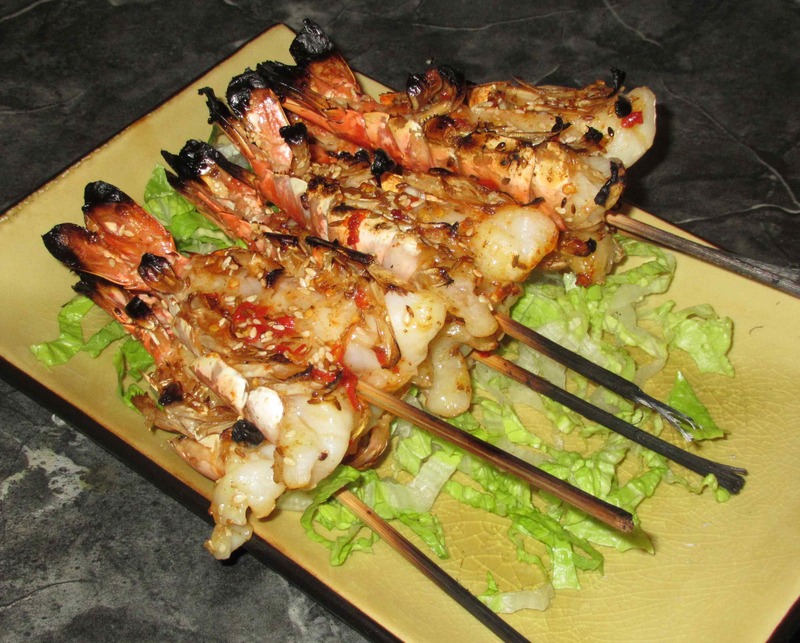 A soon as the skewers are cooked to your liking, plate and serve immediately. I served these with some pineapple rice and my wife pronounced them excellent. Other than the burned skewers, I was generally pleased although the cumin flavor could have been a bit stronger. I also would have preferred a bit more salt as the amount in the sambal oelek didn’t add the saltiness that I expected. The flesh was really succulent, though, and I think this would be a great way to do rock lobster tails. I think your shrimp look and sound delicious. I love using the huge shrimp as they are so meaty. Thank you … I hope your readers enjoy! Those are huge delicious shrimp! 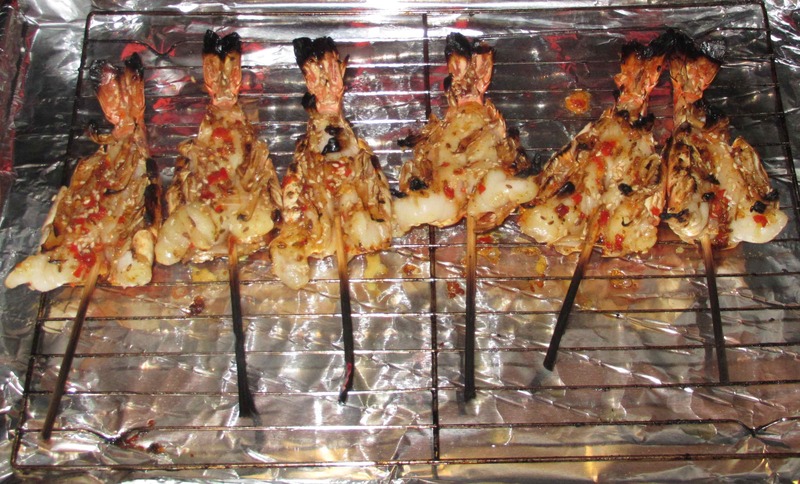 Delicious and a great idea to grill them on a stick so their tail stays flat. Sending some warm thoughts your way so you don’t have to shovel a the out to the BBQ grill. Winter appears to have turned finally. It is -13 and overcast today but we have had some nice sunny days with a noticeable shrinking of the snowbanks. We also have had icicles forming on the eaves of the roof which is a sure sign that winter will soon be over!